Presenting Psychology Helps You Tackle Your Top Ten Challenges whether you are a student or an instructor. Scientific American: Presenting Psychology empowers instructors and students for success with unique features like 10 Challenges, the new Chapter 0: Are You Ready For This?, engaging personal stories that students really connect with, and full-page infographics. Throughout the text the author teams focuses on the top 10 Challenges facing instructors. Do you face any of these in your classroom? Providing high-quality accessible visuals that make a difference! The unique “Chapter 0: Are You Ready For This?” provides students with a general sense of what the science of psychology is (and isn’t), a quick test of their current knowledge of psychology, why the discipline matters to all of us, the importance of critical thinking skills, and how to get the most out of the field of psychology. What students take from psychology will help them become a more successful student, professional, friend, partner, parent, brother, or sister—a better citizen of the world. Chapter 0 prepares them for their journey. 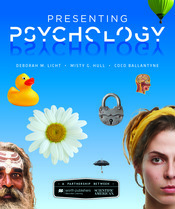 Presenting Psychology 2e is filled with high-interest examples and features, including full-page infographics and seven distinct themes that help students understand and retain key concepts. In the second edition, tech-savvy professors, Deborah Licht and Misty Hull, combine years of research and teaching insights with the journalistic skill of science writer, Coco Ballantyne, from Scientific American. Together, they have created an introductory psychology textbook and online learning platform helps turn your 10 Challenges into student engagement and success. From preparing them for the course with Chapter 0 to breaking down difficult concepts with infographics. As well written profiles and video interviews of real people and their stories to help students better understand and relate to psychology’s foundational concepts.